Last week my mom emailed me a link to St. Louis’ Dine Out For The Cure, where many local restaurants would be donating upwards of 20% of their proceeds to Susan G. Komen Race for the Cure. We decided to go out to dinner and she let me pick the place. There were so many options and I was having trouble choosing, but eventually I settled on Frazer’s Good Eats. I’d been to Frazer’s once before about a year ago and remember them having tons of interesting specials and a few vegetarian options. When lots of things on the menu sound delicious it’s a sign that I need to go back! My mom and each started with one of the appetizer specials. I ordered the asparagus salad, but kind of ruined it by removing the bleu cheese and olives (which I don’t like). It’s okay though – I just wanted the asparagus! 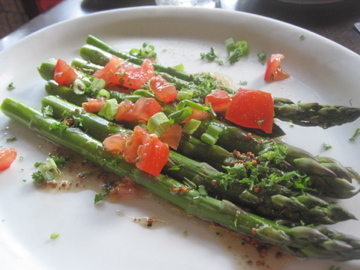 The portion was quite generous and the light olive oil vinaigrette let the flavor of the asparagus shine. My mom’s appetizer was chilled cucumber soup, made with Greek yogurt and almonds. 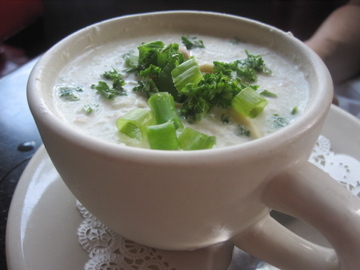 The soup sat perfectly between creamy and light and the cucumber flavor blended beautifully with the almonds. I don’t know that I would have considered them in a cucumber soup recipe, but the almonds really made the dish! For our meals, we decided to each try one of the fishes. I was tempted to try the vegetarian sweet potato enchiladas, but since I have made those at home before I decided to go with something a little bit more special. I ordered the Moroccan Talapia: marinated in charmoula, poached in a spicy Moroccan bouillabaisse, served over couscous w/almonds and raisins. Side of Harissa. Incredible! 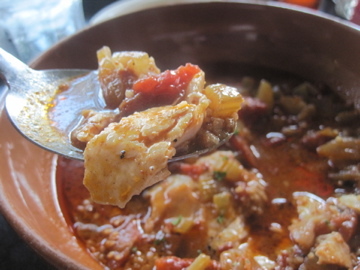 A huge portion of talapia bathing in a Moroccan broth full of tomatoes, onions, and couscous. The broth had quite the spicy kick but you could also faintly taste cinnamon. The fish was falling apart on my spoon and the couscous added the right amount of texture. I would most definitely order this dish again. 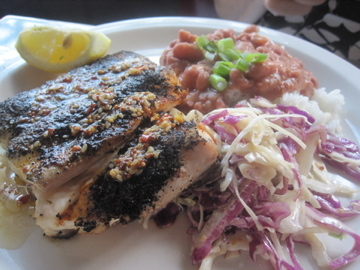 My mom ordered the Blackened Mahi Mahi which came with a sesame sauce, sesame slaw, and red beans and rice. I tried a bite of her fish and the sesame flavor was very prominent. It was delicious (reminded me of tahini!) but a bit shocking as I was expecting something sweet paired with fish. My mom enjoyed the dish and said the slaw was wonderful as well. Dinner at Frazer’s was great once again! The interior decor is kind of modern and funky in the main dining area, swanky in the bar and lounge area, and really cute outside with wooden benches and tables. It was great to get to catch up with my mom about my move to Dallas and discuss our apartment hunting trips and logistics of getting me down there. 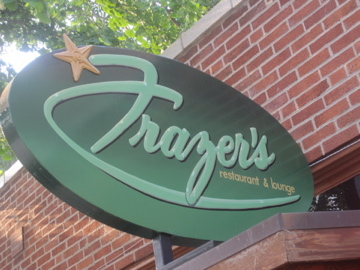 Amazing food made the night all the better – I can’t wait to get back to Frazer’s! ← How Well Do You Know Yourself? MM that sounds delicious! I love the sound of the Moroccan broth, and I can’t think of anything better than couscous with raisins as a pairing. Frazer’s is one of my favorites! My first dinner date with my now husband was at Frazer’s Brown Bag (as it used to be known….almost 10 years ago!). I have no idea what I ate, though I remember I had a glass of red wine. What I DO remember is that my now-husband ordered the special – meatloaf and mashed potatoes. And then he ordered a glass of milk. I remember thinking, “Who the heck is this guy!” Now I know, after 8 years of marriage…he’s an awesome guy who just doesn’t drink much! Anyway, I digress, but I can’t hear about Frazer’s without sharing that story! Dinner looked De-Lish, makes me wish we lived back in the city! 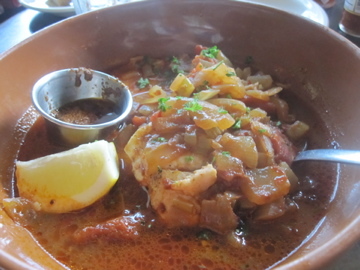 That fish dish looks flavorful and delicious!